Connect your anduinoWiFi to IFTTT. Control everything around you, or ‘let go’ and let random events in cyberspace control your surroundings! The Arduino, and most popular DIY embedded solutions for that matter are usually great at one of two things; Communicating with sensors and discrete pieces of hardware, or running complex or interpreted code and connecting to third party services (APIs). Balancing power consumption, processing capabilities, and storage will always offer tradeoffs. This usually lands us choosing between Raspberry Pi or Arduino. Raspberry Pi and embedded Linux grants you the opportunity to easily integrate third party libraries and implementations to utilize, say a Java SDK to connect to AWS. Although things can get tricky when it comes time to speak to the DHT22 temperature sensor that’s pushing readings to your S3 bucket. With Arduino, instead of having to wrap Python, on top of C, and having no real great way to guarantee consistent timing for readings; You can easily communicate to the sensor on the Arduino using the “bit-banged” proprietary protocol and less than 200 lines of code. Not to mention you’ll be hard pressed to get your Arduino MKR1000 to draw 750ma of current to get the job done. Finding a single hardware device that fulfills all these requirements is inevitably going to initiate some compromises. I might argue that a true, complete solution, would actually include both an Arduino style embedded device and an embedded Linux machine working together. But when you’ve only got your Arduino Due and anduinoWiFi shield there’s still a great way to get connected to the wonderfully diverse world of open API’s out in the wild. All of these ideas are totally possible with only a WiFi101 connected Arduino. In a recent project write up we saw how easy it is to connect Arduino to Adafruit IO using anduinoWiFi. 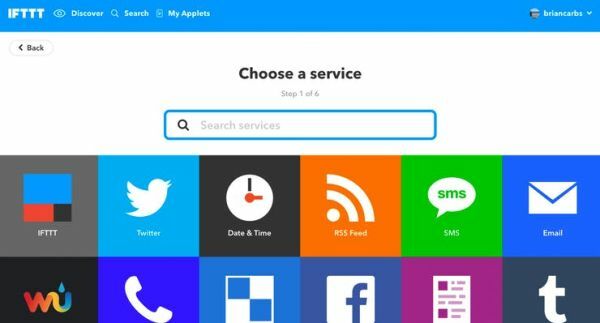 Adafruit IO is going to be our gateway to IFTTT. 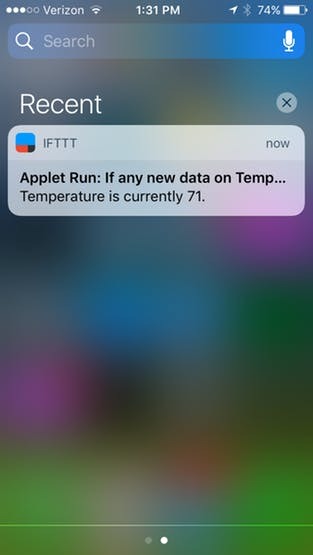 So essentially, by publishing/subscribing to feeds using MQTT (just like we did here) we’ll be able to communicate with any applet on IFTTT. 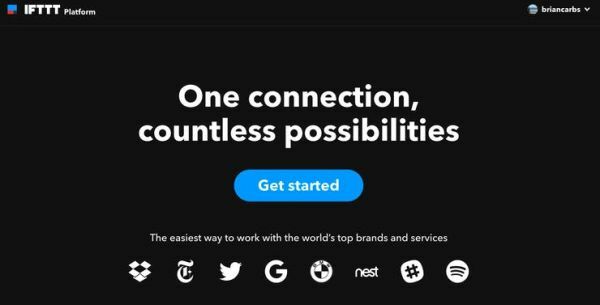 We’re going to jump right into IFTTT and assume that you’ve already tried the ‘Anduino Speaks Adafruit‘ project and are completely fluent in Adafruit IO, Adafruit MQTT, feeds, etc. If not, take a quick detour and come back in 20 minutes. 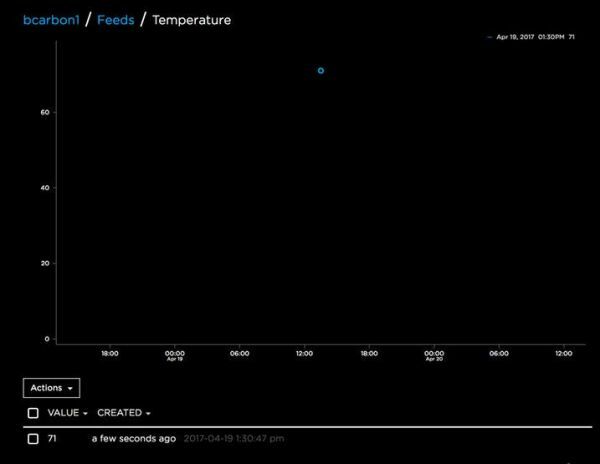 Assuming you’ve just confirmed your sensor readings in the Adafruit IO dashboard what’s next? 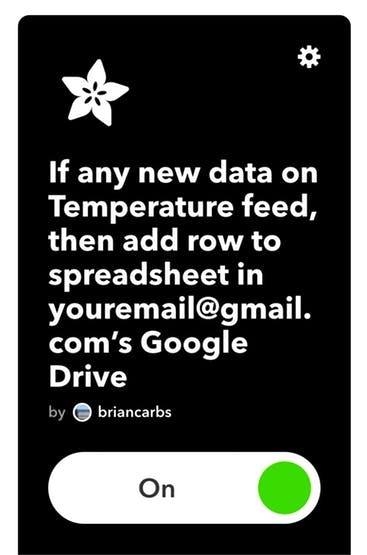 Let’s hop on over to IFTTT and get these sensor readings streaming to Google Docs. IF our Arduino has a ‘temperature reading’ log that reading in a google spreadsheet’. ‘Any new data’. This way, anytime our ‘Temperature’ feed receives new data, we’ll send it over to Google. Now we get to select our ‘trigger’ and complete the ‘that’ portion of our logic. 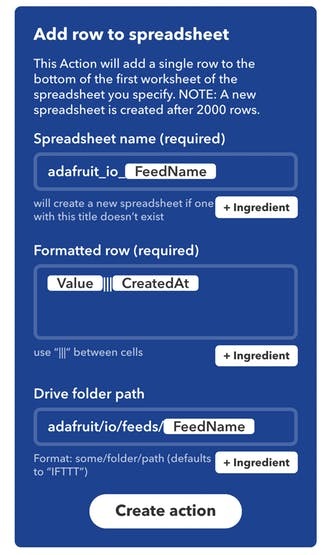 Don’t worry about creating the spreadsheet first, this applet will create one for you named ‘adafruit_io_Temperature’. (Or whatever you type in the first field.) Each row in our spreadsheet will contain our temperature value and the timestamp it was created. We even received a push notification (requires d/l of the IFTTT app on your iOS/Android phone) to let us know the new published reading. That’s it! We’ve just laid the groundwork for easily connecting your Arduino to just about any API out there. 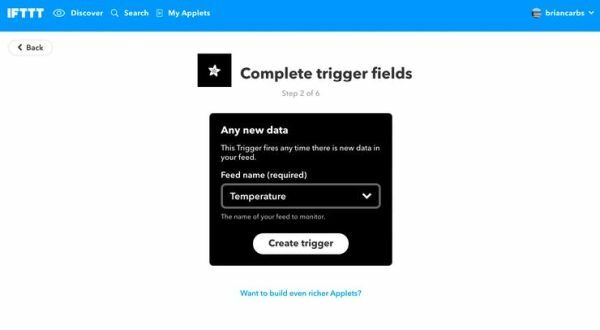 What about using a third party app as a ‘trigger’ to control something on our Arduino? Bi-directional communication is totally possible. Keep an eye out for more anduino projects where we’ll show just how easy it is to subscribe to feed data using MQTT and actuate something in your environment using the Arduino. Can’t wait to see what you create using IFTTT, Adafruit IO, and anduinoWiFi! An Arduino library for the Andium(Anduino) shield. Transform your Arduino into an AndiumNode.